Conversation Garden | This is a website. Other things we do or people we know and approve of what they do. It is with regret that we announce that Conversation Garden has come to AN END. (THAT’S RIGHT END. And by that we mean on hiatus/sabbatical. We don’t want it to be forever, but who knows?) We’ve all had a fun and exhausting couple of years doing this thang, but there comes a moment in every chat-show’s life when you have to step back and never talk to your co-hosts again. (Despite the living arrangements – it’s very awkward) We’re not saying we’re never going to talk to each other again. Or that we’re going to deliberately miss each other’s weddings. We’re not saying that. What we are saying is that we’re ready to move on and want to do new exciting things. Lewys has got a great new performance, ‘Of Or At A Fairly Low Temperature’ exploring the notion of being cool…Jack has found love, he also has a piece, ‘1.9’ about his first love, parkour, so he’s the real winner here .Shitbag. And Dan will be going into a recording studio, to make his first solo album. Is making some new shows. A solo show ‘Reverb (The love story of Terrance the Crocodile and Julia the Mannequin)’, and a sketch/ stand up show ‘Yours Desperately, Dan and Lydia’ with fellow comedian Lydia Rickards. We have also formed a collective with Dance Artist, Katherine Hall called Tetrad and are putting a performance platform night on at Embrace Arts, the first night of ‘Us and Them’ is on the 23rd of November, and will be featuring some great artists as well as Lewys’ very own performance. Heather Forknell, Robert Hardaker, Bone Cult, Joe Ross Williams, John Helps and Handmade Festival, Holly Holdsworth, Joe Richards, James Langley, Yusef Mustafa, Sam Plummer and the guys at Demon Media, Jonny Mclean, Kirsty Mealing, Paul Rodgers, Naomi Galliford Sam Javid, Elizabeth Arthur and all our guests. Marilyn Minx and Bella Bardot, all the acts that performed at our cabaret nights, Georgie Tansell, St. Martins Coffee, Lydia Rickards, Sean Morely, Dave Taylor, Cliff, and all the venues on the tour. James Hissett, Briony Latter, Ash Brown, Claire Gemma. And last but not Least Gary, Sally and Verity at Upstairs at the Western without whom none of this would have been possible. Between January 2013 and October 2014 we’ve put together over 60 online videos, 8 different shows one of which was in our very garden, streamed live on the internet. Held a series of events at a Coffee Shop. We did the Edinburgh Fringe Festival, and have now finished a (small) UK tour. We’ll be doing a small screening of our online videos in Dave’s Leicester Comedy Festival next year. But for now, we’ve been Daniel Nicholas, Jack Britton, Lewys Holt. We are Conversation Garden. Things are certainly hotting up as the boys prepare for their final preview. Dan is full of resentement for the press after doing an interview with a newspaper, for a story about local comedians going to Edinburgh Fringe. They didn’t run the story. Not even a mention. 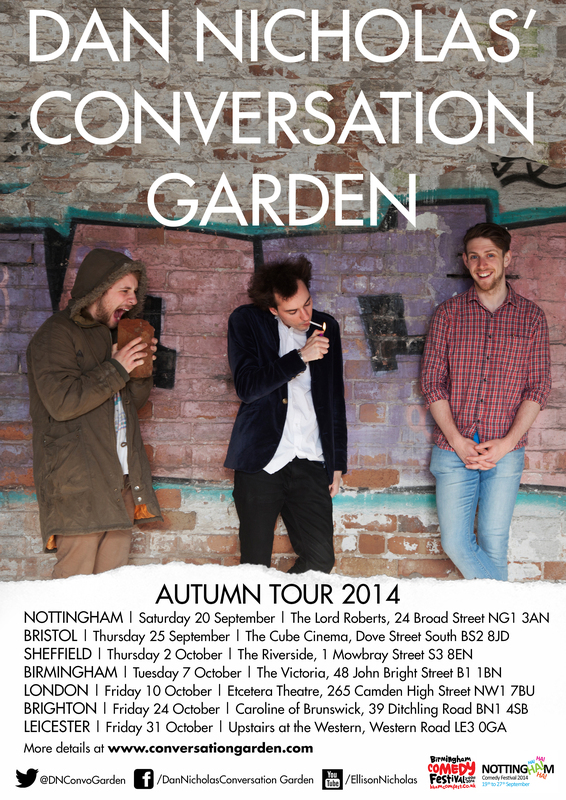 Like a lingering smell, the Conversation Garden Boys are back. With local comedian Dan Nicholas (shortlisted for the BBC Comedy Award 2013) hosting a chat show like no other. Assisted by his two house mates Jack Britton and Lewys Holt they bring to you a fun filled evening of songs, arguments and audience interaction for the last time before they set off to conquer the Edinburgh Fringe Festival. If you haven’t heard of Dan Nicholas’ Conversation Garden yet then you’re missing out, or their social media presence isn’t nearly as big as they hoped it was. The trio have spent the last year RELENTLESSLY doing shows in Leicester and really haven’t gained that much more of an audience. They have wasted their time sending press releases out, making lo-fi youtube videos, and some pretty sketchy tweets to a lack of acknowledgement from virtually anyone but their friends who think it’s ‘nice that they’re keeping themselves busy’. Their latest endeavour has been to be put on a series of events at new hip happening place St.Martins Coffee, from Speed dating to Treasure Hunt via a Cabaret Night, this has seen an interest in the trio by almost 100%. Followed up with a debatably successful performance at Handmade Festival, it could be said Dan and co. are on fire right now. 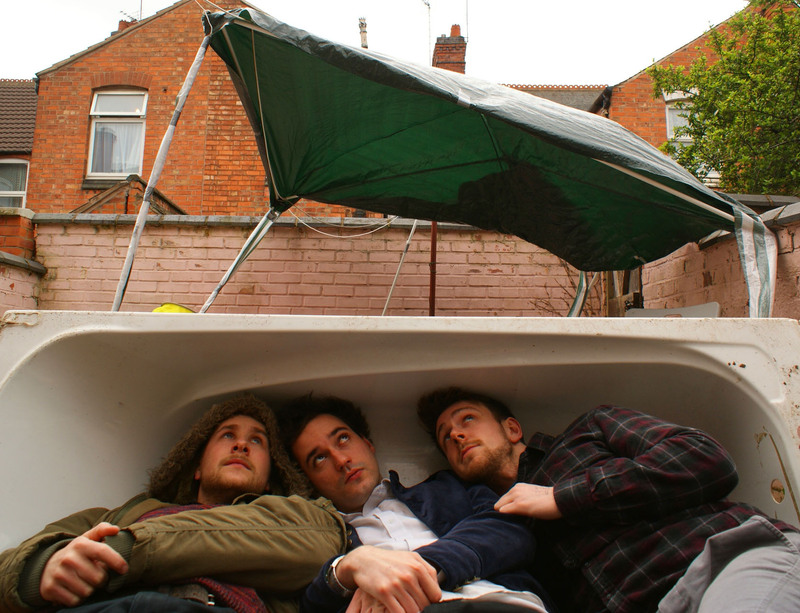 This is the last show Dan, Lewys and Jack are doing together where they are all living together as housemates, as time goes on, the future past October is uncertain for the team. But one thing’s for sure they will go out with a bang. This could be one of the final chances to see them. And regret is ugly. What are you waiting for pick up the phone and ring me. **N.B we’ve decided on doing a recreation of Sliding Doors Instead. Hello neglected website how have you been? We really haven’t been on top of things as much as we should on here. There once was a time when only the website got updated, now that has become a faded past as it’s all about the faecesbooks and the twitters, SOCIAL MEDIA. Websites don’t really ever get a look in. THIS WILL STOP TODAY! We are in a dawn of a new time, a new age, a new world. Where this website might get updated a bit more, fingers crossed. Since the last post, a lot of things have happened. There is a lot of change in the air. Before all that, if you are one of the people who saw us in the well advertised Leeds show, or the less- advertised –because-Dan-Got-Caught-up-in-life-Birmingham Gig, thank you. They’ve been great and confidence for most of us at the moment is through the roof. So much so that Jack has signed up to Skydiving classes this Wednesday, Dan’s signed up to teach them. Lewys is doing Lewys type things. But Alas it is an end of an era, as we got kicked out of our house. And by that we mean, our tenancy came to a drastic and most horrible end, and by that we mean, it was just the end of the contract. And we parted ways…..kind of. Jack moved in with his girlfriend (yes he has a girlfriend, sorry ladies) leaving Lewys and Dan to find themselves a flat. There wasn’t an emotional goodbye, no tears were shed. No word was said. Dans just been listening to a lot of Suede. I’m sure a lot of you may have be wondering, ‘what happened to the mattress, and the beloved bathtub, it’s bound to be worth a lot of money some day’ …..we are not at liberty to discuss the whereabouts of these objects. SO THE TREASURE HUNT IS OVER. And what fun we had, two people had asthma attacks, and one person threw up. (people were encouraged to run, they didn’t have to we’re not liable for anything) our events are DANGEROUS (they’re not really, they’re what you make of it). And then we went quiet as we’ve got nothing on for a while till the end of June, in the mean time we’ve been refining the show to make it the perfect. Thus so far through a series of meetings, Dan has is on the third draft of the introduction. We are announcing shows in the Autumn soon, so keep your eyes peeled. How have you been? We’ve been busy, Dan’s visited Bristol to see friends from yesteryear. Jack has spent the week reading how to train your dragon and Lewys has been doing Lewys type things. That and we did Handmade Festival. We had a great time there – if you saw us thanks for coming, if you didn’t. Don’t worry about it we’re previewing the show in a number of places before we take it to Edinburgh. THIS WEEK IS TREASURE HUNT. You can also get tickets to ‘Another Cabaret Night’ on that link as well, we’re excited as we’ve got some fantastic acts booked for it, more details to be announced soon. For now though, why not look for that Treasure? Our favourite time of year, Handmade Festival at the start of summer is here. After having a lot of fun last year, we will be returning on the 3rd of May we will be returning to Handmade Festival to perform a preview of the show that we will be taking to Edinburgh Fringe Festival! 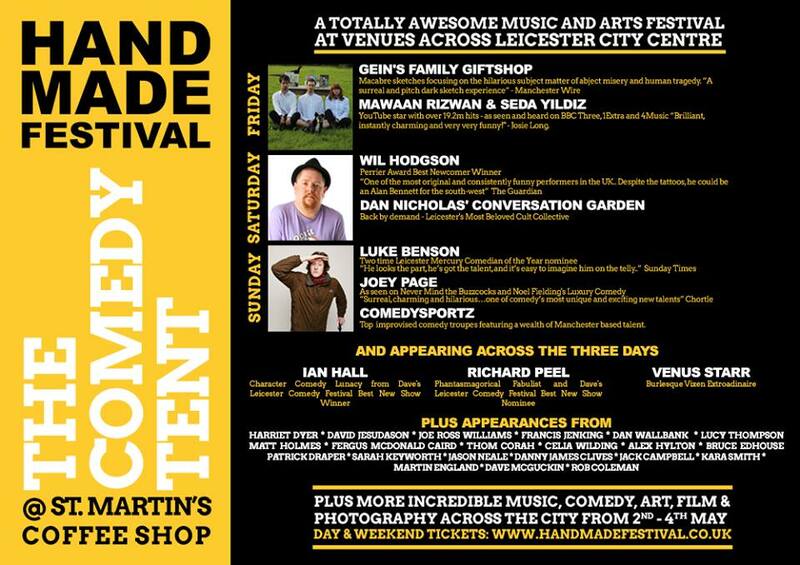 Handmade Festival has a fantastic line up of music and comedy, and the Art has been curated by our very own photographer Heather Forknell. The show will feature some of our favourite bits from the past year as well as a new convoluted story line. Expect audience interaction and Challenges a plenty. We have a number of previews/dates for you to put in that dusty black diary.. If you’re in any of these areas at any of these times come along watch the show, buy us a drink etc. and of course we still have the events at St.Martins Coffee Shop, with the first Cabaret Night being this evening! Other Pages on this website. Put a bookmark in our face.